A dark-eyed junco (Junco hyemalis) rests on a bird feeder. Typically when we think snowbird, we think of our grandparents heading to Florida for the winter. They escape the cold and fly south to the sunny shores of the Gulf of Mexico. But did you know there are also snowbirds who fly south to your backyard every winter? Before you call the police, don’t worry; there are no Canadian grandparents lurking in your backyard. I’m talking about dark-eyed juncos, Junco hyemalis. Although the common name snowbird has fallen out of favor, it is still apropos as dark-eyed juncos are only found here in the winter. 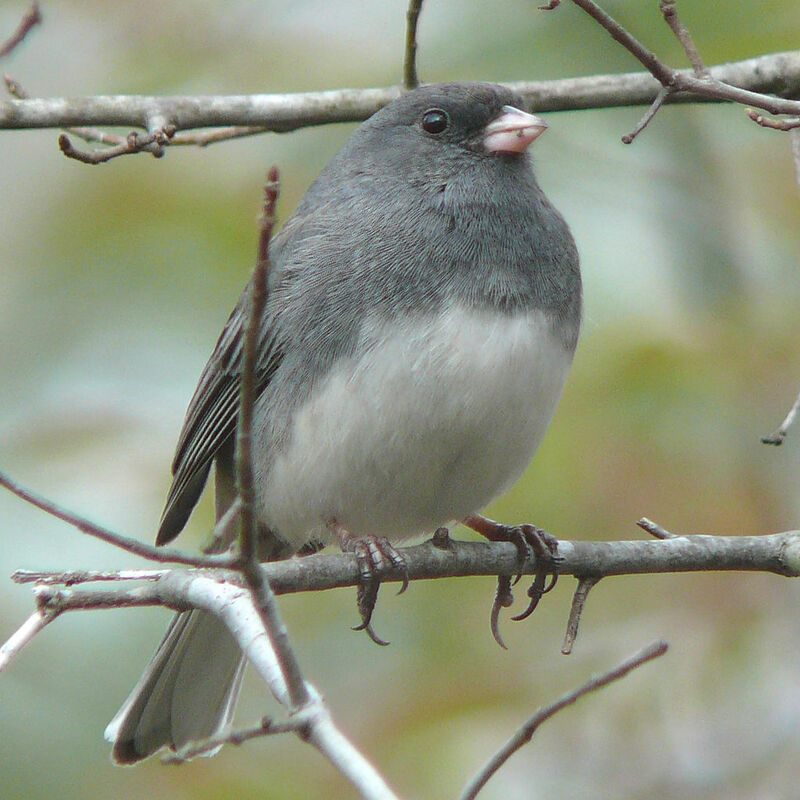 Dark-eyed juncos are remarkable for their ability to adapt to various habitats. They range throughout North America, but their plumage varies greatly from region to region. There are six different plumage variations; however, east of the Mississippi River we only find the slate-colored variation: gray head and back with a white belly. Their tail is also slate gray with white outer tail feathers. Their dark plumage stands out in stark contrast to the snow, making it a beautiful winter scene. If you have bird feeders in your yard, chances are you have seen one of these sparrows. Juncos live and nest near the ground during the breeding season in northern climates, so it’s natural to find them on the ground when they migrate south to us in winter. They are commonly spotted under a bird feeder dancing. That’s right, dancing. They hop back and forth kicking up snow to reveal the seeds underneath. Juncos have been studied extensively and much research continues today. William Rowan used dark-eyed juncos in experiments in 1924, which laid the foundation in proving photoperiod (or the amount of daylight in a 24-hour period) was the stimulus for bird migration. He kept juncos in an outside enclosure through the winter, regularly increasing artificial light to simulate a growing photoperiod. The male juncos began exhibiting spring behavior, such as calling for a mate, well before spring, having been tricked by the artificial lighting. Rowan’s experiments were groundbreaking and we have the dark-eyed juncos to thank for that. 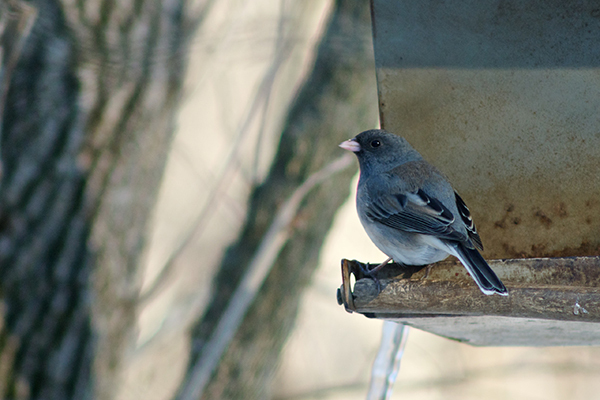 Next time you peer outside to your bird feeders, keep an eye out for the dark-eyed junco. If you’re lucky, you’ll see their mad dancing skills. At the least, I hope you have a little greater appreciation for these winter migrants.